Our approach is to practice High Value Care* - which means, balancing clinical benefit of a treatment with its harms so that we can achieve best possible outcomes for you. It is a new guiding principle that we believe is the right one for our patients. That more care - more interventions provided to you - is not necessarily better care! Good care is one that is evidence-based, individualized and a partnership between the doctor and the patient with mutual trust and respect. two profiles were found for Carelife.md in social networks. Among other social networks the website is represented in Facebook and LinkedIn. The web server used by Carelife.md is located in Milan, Italy and is run by Wind Telecomunicazioni. The server runs exclusively the website Carelife.md. 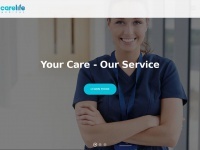 The Carelife.md websites were developed using the programming language PHP and served by a Apache server. For managing the data of the webpages the CMS WordPress in the version 4.7.1 is used. The website uses the latest markup standard HTML 5. The website does not specify details about the inclusion of its content in search engines. For this reason the content will be included by search engines.